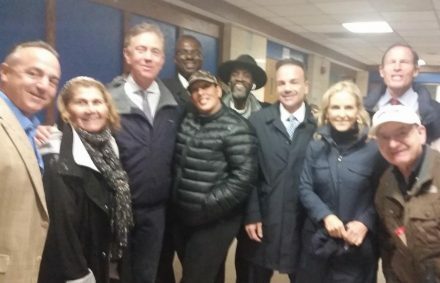 Ned Lamont on election day surrounded by supporters inside the old Harding High School, from left Probate Judge Paul Ganim, City Clerk Lydia Martinez, Lamont, DTC member Tony Barr, City Council members Eneida Martinez, Ernie Newton, Mayor Joe Ganim, Ned’s wife Annie, U.S. Senator Richard Blumenthal, Town Chair Mario Testa. Talk about a long day’s journey into the next morning, the statewide result for governor shows Democrat Ned Lamont the winner with Bridgeport delivering a 16,000-vote plurality over Republican Bob Stefanowski, according to unofficial returns on the Connecticut Secretary of State’s website. See statewide results here. Stefanowski issued a statement shortly after 9 a.m. Wednesday conceding the race to Lamont. “Earlier this morning, I received a call from Bob Stefanowski,” said Lamont in a statement. “After a long campaign, he could not have been more gracious, and I could not be more appreciative. I look forward to working with him, because we all need to come together–regardless of party–to solve our state’s biggest challenges. Lamont will receive the oath of office in January. He’ll face a number of sobering issues led by the state’s fiscal battle. In addition new revenue sources such as tolls, marijuana and gaming will be on the table. The statewide results show Lamont with 658,353 to 640,369 for Stefanowski with about 6 percent yet to report, including New Haven precinct results. The New Haven Independent reports, however, that Lamont leads in New Haven 22,035 to 3,919. New Haven experienced a chaotic election day with machine breakdowns. Lamont has 20,847 votes to Stefanowski’s 4,916, according to the unofficial Bridgeport count. Democrats picked up legislative seats and will enjoy the majority in both the State House and Senate. While this is not the result we would have hoped for, I am glad that we were able to draw so much attention to the tax burden in this state. Think about it–at the beginning of this race, we were laser-focused on cutting taxes, while other candidates were talking about raising taxes. We were able to mold the discussion in such a way that the other candidates slowly began to come around to the same conclusion to varying degrees. I am hopeful that by relentlessly focusing on that issue we’ve started the conversation on how we can start to bring the tax burden on Connecticut families down. Words cannot express how humbled and honored I am at the tremendous support we received from people all across Connecticut during this campaign. This road hasn’t been easy on any of us, but I want to thank my incredible wife Amy and my 3 beautiful girls for taking this journey with me–for having my back throughout this campaign–for putting up with the late nights and the nasty ads–and for encouraging me when I questioned whether we were doing the right thing. I also want to thank to thank our army of tireless supporters who donated, put in countless hours on the phones, knocked doors, and helped to get out the vote. I will be forever grateful for the love and support this state has shown me, my family and this campaign over the last year. I have learned a lot over the course of this campaign, but the biggest takeaway for me has been the realization that CT is one big family. That won’t end with the campaign. We will continue to share that bond regardless of today’s outcome. 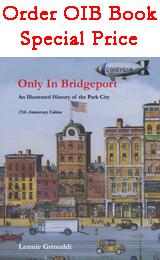 Next Post:Will Ned Lamont Do For Bridgeport As Lowell Weicker? Wow! Bridgeport got the vote out. Ned owes Bridgeport, good Job Mario 🙂 Bam I’m out. Let’s be real clear here, the 16,000 margin of victory for Lamont in Bridgeport was NOT because of the get out the vote of Joe Ganim and Mario Testa because they were still feeling sorry and licking their wounds about their lost to Lamont. Ned Lamont is being declared the winner in unofficial returns winning by 10,000 votes. 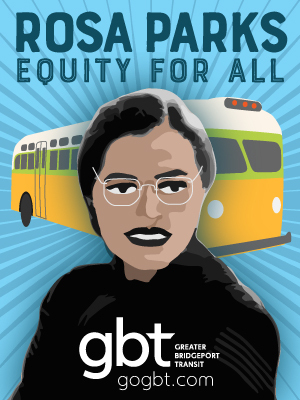 I just hope that Lamont remembers his promise to Bridgeport – and keeps it! Any figures available on how ABs factored in? A terrible candidate like Stefanowski still made this very tight. Ned better remember promises made and start doing something to fix the broken economics of CT. If not, if the republicans ever get their act together and nominate someone likeable, the state could turn red again very easily. Ned ought to use his head, remember the promises he made to the people of the city of Bridgeport. The casino’s a nonstarter. We need jobs, property tax relief, and investment in the city’s crumbling infrastructure. Lennie, Bridgeport delivers for Ned is not news. This was a no-brainer. 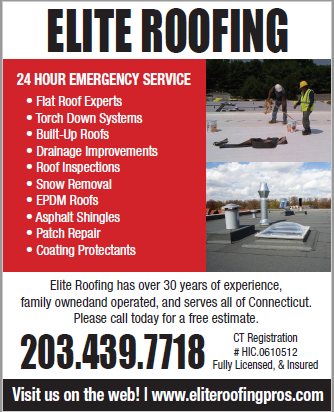 New Haven delivered too and I’m sure the pols up there feel that they are the king makers. Could Working Family Party stake claim of king maker? Ned was cross endorsed by WFP while the Independent Party backed Bob? What good did the cross endorsements do for them? Can OIB provide results that include numbers under the cross endorsing parties? 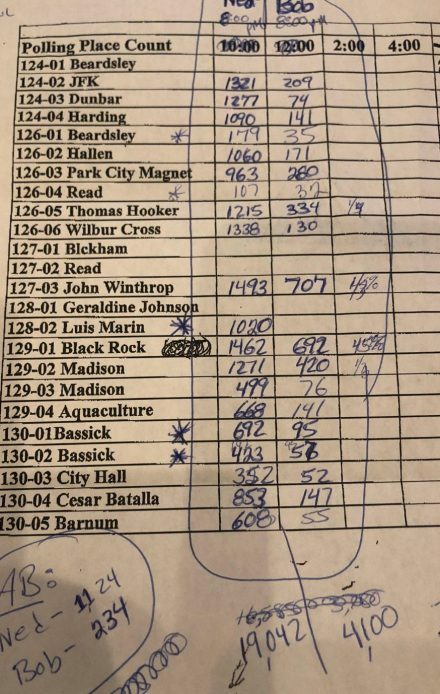 Joel, the WFP and Independent line votes are factored into the overall numbers. Readers can link over to the SOTS site and examine the returns. As for the urban vote nothing wrong with New Haven, Hartford and Bridgeport all declaring themselves the mailman. They delivered. Remove the urban vote and Ned’s not governor. We will see if he puts words into action with what he has promised Bridgeport. Malloy was a lot of talk spewing hot air. Lennie, you said, As for the urban vote nothing wrong with New Haven, Hartford and Bridgeport all declaring themselves the mailman but of these three mayors of these cities only New Haven’s mayor, Toni Harp was out front pushing for Lamont. On a sidebar, Connecticut needs to go to early voting, 34 states permit no-excuse early voting. Lennie, I think Donald Trump did more to deliver for democrats in Connecticut as well as for those running for congress across the country. Malloy wasn’t the only the Democrat spewing hot air the past 8 years. Why do they keep getting elected and some have even been promoted to higher office? Why did you ask Senator Moore about her running for mayor when you could have asked her the $4.5 billion question? So ned performed better than malloy in bridgeport. Alot of people said that would not happen! Way more people voted this midterm than in 2014 in bridgeport and lamont received 4 thousand more votes in Bridgeport than malloy!!! Malloy won bridgeport 78 to 22 last time around lamont won bridgeport 80 perecent to stefanwoski 18.9 percent. Bridgeport turnout was very shocking!!! Ned should set up an Office in Bridgeport, to show his support. Most likely Ganim and Mario will not be here next year, so having a second Governor’s office will serv Bridgeport well. Oh please people don’t credit Mario, Mayor Ganim, the DTC or any of the pseudo political whores for the large turnout in Bridgeport or the inner cities. This election for Black people was a referendum on 45 especially after Stefanowski gave 45 an A rating. Those political whores and you know who they are and they know who they are, played NO part in getting the vote out for Ned, NONE. Don, base on President 45’s speech today he said those Republicans that didn’t enbrace him lost and he said that he didn’t have any problem with that. I guess Bob Stefanowski didn’t show the love that 45 needs so he didn’t come to Connecticut. Oh well, but we all know that Joe and Mario didn’t have anything to do with that 16,000 vote margin. Somebody needs to check on Tom White. The Hearst Connecticut Media Group/Sacred Heart University Poll has shown that it can not be trusted and Governor Stefanowski should be really pissed at them. And people lie. All the time. Ron’s you agree with Trump Fake News. Excuuuuse me ..I already explained the SHU poll. They go ask Jack Welch and his answer is weighted for ten points. Owen ….H. Clinton had 3 million more votes than pumpkin face Trump. It is the antiquated Electoral System that gave Trump the Oval Office. I suggest you do some research on the Electoral College. The Electoral College was created for “states rights” and also to give extra weight to Southern States which were underpopulated(and not including Black Slaves-who were considered non-human at the creation of the original Constitution). The Electoral College(which gave George W. Bush and Donald Trump their “victory”) was a means to address racist thoughts during the 1780’s+ when the United States Government was being created “on the Fly.” Owen..do your history. Frank, you are dealing with a Russian troll. Final tallies were still not available mid-Wednesday for New Haven’s vote. But based on results reported from the polling places by dozens of New Haven Independent volunteers, the city gave Democrat Lamont well more than a 20,500-vote margin over Republican Bob Stefanowski. That was by far the largest victory margin in any Connecticut community. It was also thousands of votes more than the Elm City produced for Lamont’s predecessor, Dannel P. Malloy, in the two elections he won with the help of New Haven’s Democrats more than any other group. Tolls are entitlements. Ii’s don’t got no mo money massa Denzin to pay taxes. Iii’s just bought another new Benz wit my entitlement money and iii’s got nuttin left fo taxes massa. Po me, po me. New York and Massachusetts have tolls. I don’t know about RI. Toll roads have been part of the USA DNA/road experience . CT stopped tolls because of the gut reaction to the accidents that were happening at the cheap and antiquated toll stations. CT has always wanted to do things on the cheap. that’s why we had toll booth accidents. That’ s why we had the Mianus /I-95 bridge collapse. The State of CT doing things on the cheap has resulted in people dying.